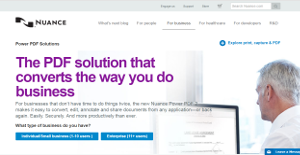 What is Nuance Power PDF? Nuance Power PDF is a solution that makes it simple to convert, edit, annotate, and share documents from any application, or back again. You can use this app to work easily, securely, and more productively. Individuals and small business can use the Power PDF Standard 2 package which is a new intuitive PDF converter with an affordable price. Large businesses and enterprises are targeted with the Power PDF Advanced 2 version which boasts redaction, security, connectivity, and volume licensing capabilities. What are the highlights of Nuance Power PDF? It provides an easy to use interface for PCs and 2-in-1 laptops and is Windows 10 ready. You can easily create a PDF file from Office documents and automatically convert a PDF file to Office documents. Plus, you can digitally sign your document. Other advantages are you can compare documents side by side to locate changes. Redact confidential information from documents. Apply Bates stamping to one or a set of documents. Connect to popular document managements systems. On top of that, you can automate PDF creation jobs using a watched folder. Finally, the vendor offers volume discounts which make the software even more affordable. Nuance Power PDF is intuitively designed for a better PDF experience. It is dynamic and easy to use. You can work faster as the app offers a smart, secure, and compatible way to read, create, edit, and convert your forms and documents with understandable tools. You need not re-type or re-create a document as you can easily covert PDFs back into any editable formats. The app faithfully and accurately reproduces complex layouts that have with graphics, tables, and columns. Nuance Power PDF makes collaboration easy as it is optimized for Windows 10 and touch screen devices. It allows connectivity to leading cloud services and protects your documents from unwanted access. You can gain control of PDF workflows by exploring this all-in-one PDF converter, PDF creator, and PDF editing software designed for business. Many users prefer Nuance Power PDF to Adobe Acrobat as the former is faster and more affordable. Rendering is accurate and you can even use a complex mix of images and text. Plus, the app offers useful markup and other document manipulation tools. Nuance Power PDF stands out among the crowd because it is easy to use and offers great functionality at an affordable price. If you need a PDF for five or more people, this app is a great choice as it is designed for the needs and industry specific workflows of business teams and units. Contact the vendor to learn about flexible licensing programs, with no seat count or auditing. Every company has its own characteristics, and might call for a particular type of Collaboration Software solution that will be designed for their company size, type of clients and staff and even specific industry they cater to. It's not wise to count on getting an ideal software that is going to be suitable for every business regardless of their history is. It may be a good idea to read a few Nuance Power PDF reviews first and even then you should pay attention to what the software is intended to do for your business and your employees. Do you need an easy and intuitive service with only elementary functions? Will you really use the advanced functionalities needed by pros and large enterprises? Are there any particular features that are especially practical for the industry you work in? If you ask yourself these questions it is going to be much easier to get a solid software that will match your budget. How Much Does Nuance Power PDF Cost? We realize that when you make a decision to buy Document Management Software it’s important not only to see how experts evaluate it in their reviews, but also to find out if the real people and companies that buy it are actually satisfied with the product. That’s why we’ve created our behavior-based Customer Satisfaction Algorithm™ that gathers customer reviews, comments and Nuance Power PDF reviews across a wide range of social media sites. The data is then presented in an easy to digest form showing how many people had positive and negative experience with Nuance Power PDF. With that information at hand you should be equipped to make an informed buying decision that you won’t regret. What are Nuance Power PDF pricing details? What integrations are available for Nuance Power PDF? If you need more information about Nuance Power PDF or you simply have a question let us know what you need and we’ll forward your request directly to the vendor.